New York firm Gachot Studios custom made the mohair sofas, blue paint and fire grate that feature in this hotel in Detroit, designed for American watch brand Shinola. Shinola Hotel forms part of Shinola, a watch company based in Detroit that prides itself on American products. Most of its leather straps and goods made using leather supplied by Chicago-based tannery, Horween Leather, founded in 1905. For the project, Gachot Studios overhauled an historic, terracotta-clad building that completed in 1915 by TB Rayl Company. It now accommodates 129 rooms across 10 storeys, as well as numerous lounges and restaurants. The interiors feature a number of custom details designed by the studio, including a Shinola Blue paint colour that covers the ceiling in a foyer in high gloss lacquer. A reception desk in this area is made of mahogany. Numerous custom furnishing by Gachot Studios decorates a sitting area, which measures 1,400 square feet (130 square metres). Sofas range from caramel mohair, dark brown and light blue. A central Arabescato Grigio stone fireplace has a custom metal grate, while throw pillows are sourced French textile designers Toyine and Le Manach. 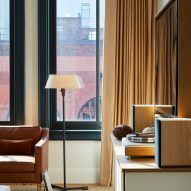 Gachot Studios also chose dozens of books and objects for Shinola Hotel, and a vast collection of artwork was curated by JJ Curis of Bedrock and Shinola. Proper hotel in San Francisco by Kelly Wearstler is decorated similarly, with lots of different furnishings and art pieces. A historic existing staircase to the mezzanine was preserved with a metalwork bannister and finished with a hazel-coloured stair runner. At the top are a pool table and more seating. A dimly lit cocktail bar has soft pink hues and is called Evening Bar, while Southern Italian cuisine is served at San Morello, complete with chequerboard floors and warm wood finishes. Other eateries inside Shinola Hotel are Penny Red's, which serves Detroit-style fried chicken, and The Brakeman, designed as a beer house with long wood tables and benches. Hotel rooms at Shinola have a pared-back style, drawing attention to the bones of the historic structure. Golden-coloured curtains drape against large, black-trimmed windows, amplifying the building's tall ceilings. Floors pick up on this warmth with pale wood and soft grey carpets. The bed frames are also in light wood and have cream-upholstered headboards. 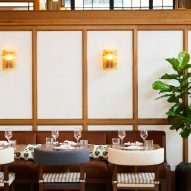 Gachot Studios' designs for hotels often specialise in wood furnishings, as seen in the firm's work for Eaton in Washington DC, with dark wood pieces and retro touches. 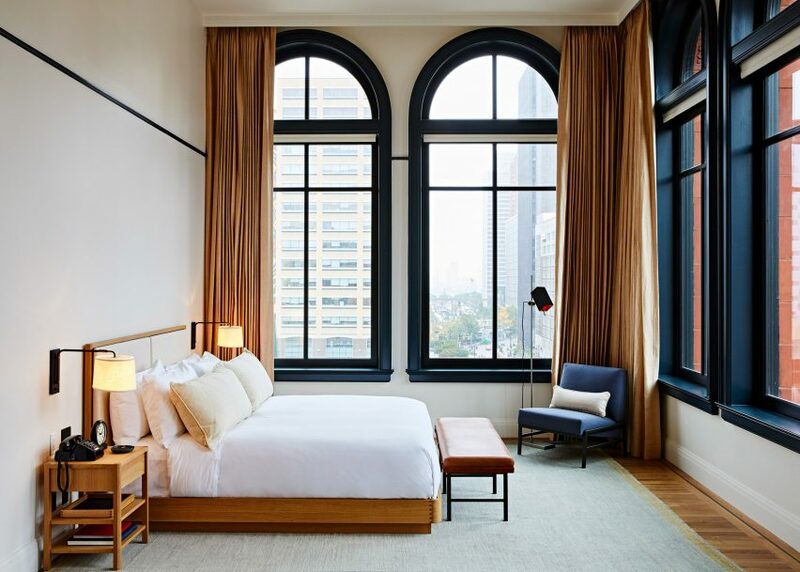 Bed coverings at Shinola Hotel are white, and the bathrooms are simple also with white and black tiles and dark wood vanities. Retail stores also are part of the hotel project, including one for Shinola itself. Gachot Studios was founded by John and Christine Gachot and is based in Manhattan, where it has completed a number of projects. These include a flagship store for beauty brand Glossier and a restaurant in Union Square Park.